It’s April 1st!!! What pranks have been played on you today? 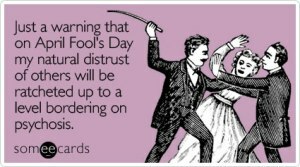 Or are you the prankster? I went to the dentist – what a way to spend April Fool’s Day for once I was hoping that they were pranking me and my appointment was a joke! But sadly it was not the case….. Enjoy this reblog of a bit of April Fool’s poetry via Charles Yallowitz – Legends of Windemere. Or coaxing you into their web? This entry was posted in Humour and tagged April Fool's Day, Charles Yallowitz, humour, Poetry, Reblog. Bookmark the permalink. I’m sorry to hear your visit to the dentist was not just a harmless prank. I hope it wasn’t too painful.